If double deals are what you like, book directly on our site! Spend special moments in our hotel, located by the picturesque Lake Malta. The location in a green and peaceful area, away from the hustle and bustle of the city center is a perfect place for a stay for two, with the family, a conference and company training, as well as the organization of a wedding reception. Good for a business trip to Poznan. 30' from the airport. The rooms are OK and clean. The staff is friendly and efficient. Breakfast is pleasant as well. Located on a lake shore. Professional and smiling team is a guarantee of a high-quality service. For business guests, we offer 4 professionally equipped conference rooms accommodating up to 230 people. A professional team and years of experience guarantee success of any conference we arrange. Panorama Restaurant serves a modern version of the regional cuisine. A talented Chef - a laureate of many culinary awards - takes care of the quality of our dishes. We organize unforgettable wedding receptions, special events, baptisms, communions and larger family gatherings. We will take care of every detail and we will make this day historical. 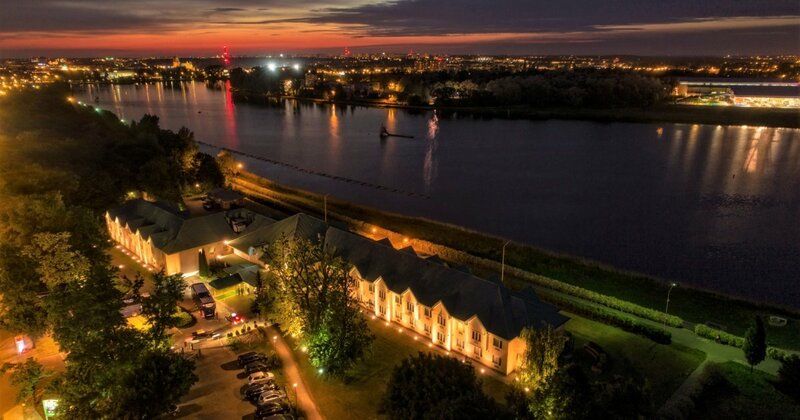 The hotel's location away from the hustle and bustle of the city, right by Lake Malta makes our hotel an ideal place for both work and leisure. We are only 4 km to the very center of Poznań. The hotel is surrounded by amazing recreational areas, a pool complex of Termy Maltańskie, an artificial ski slope, a toboggan run, and a bike path. There is also a picturesque zoo in the vicinity, where guests can spend great time with their families.